Taking advantage of seasonal produce is definitely one of the most important principles of budget byting. I mean, anytime you can get produce for under $1 per lb, you’ve just gotta do it! 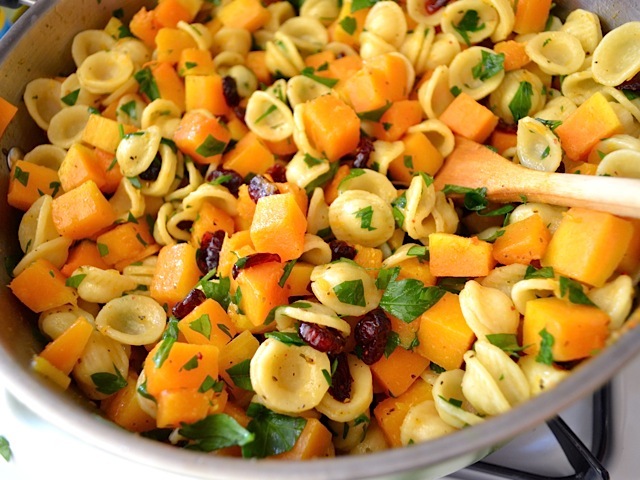 Butternut squash is one of my favorite fall vegetables. It’s bright color and rich flavor make it wonderful to add to soups, salads, and pasta. Butternut squash can be quite large and a little difficult to handle. Luckily, once you get the squash peeled and cubed, you can freeze half of it and use it in recipes later. Prep once, cook multiple times. Thank you, freezer! I probably should have froze half of my cubed squash because this recipe made a TON. I priced it out for 8 servings per recipe but it might actually be closer to 10. Luckily, the finished salad freezes well, too! I’ve been eating this salad warmed up in the microwave, so when I want to eat the portions that I froze, I’ll just microwave it until it is heated through. I didn’t make a “dressing” for this salad because I found that just a little olive oil, salt, pepper, and parmesan was enough for me. If you’re the type that needs more moisture, try something a little sweet, like a raspberry vinaigrette. The sweetness will compliment the cranberries nicely. 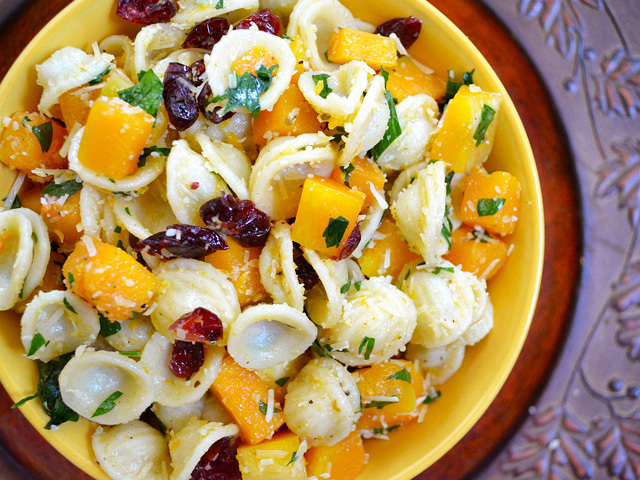 This butternut squash pasta salad is both sweet and savory with parmesan cheese and sweet-tart cranberries. 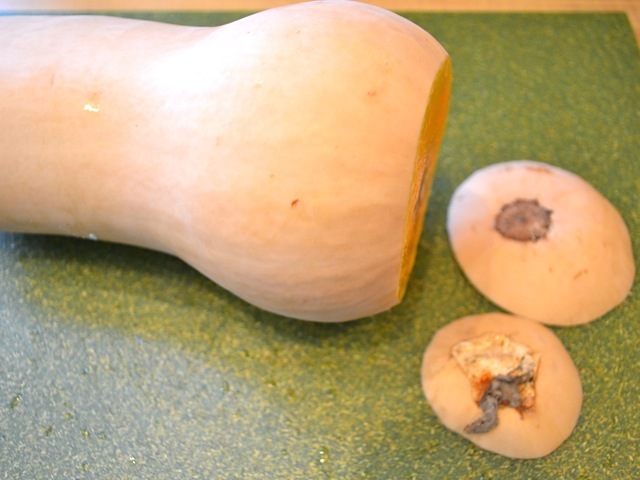 Cut the ends off of the squash to provide a flat, stable surface. Stand the squash on one end and use a vegetable peeler to remove the skin. Slice a few rounds off of the small end to shorten the squash, and then cut down through the center of the thick end to expose the center. Use a spoon to scoop out the seeds and center pulp. 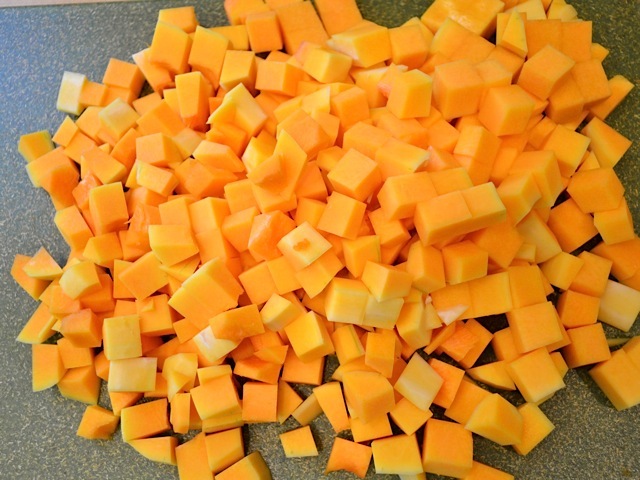 Cut the remaining squash into small cubes. Heat 2 Tbsp of olive oil in a large pot or skillet over medium heat. Once the oil is hot, add the cubed squash, sage, salt & pepper (a generous sprinkle). Saute until the squash tender (about 10-15 min). They will looks slightly translucent and will start to smash a little like a cooked potato. Taste a cube or two to make sure they’re cooked through. Turn the heat off. 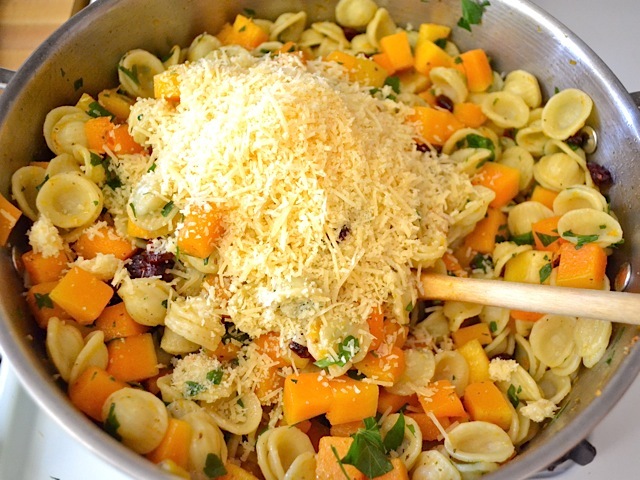 While the squash is cooking, cook the pasta. Bring a pot of water to a boil and add a generous sprinkle of salt to the pasta water for flavor. 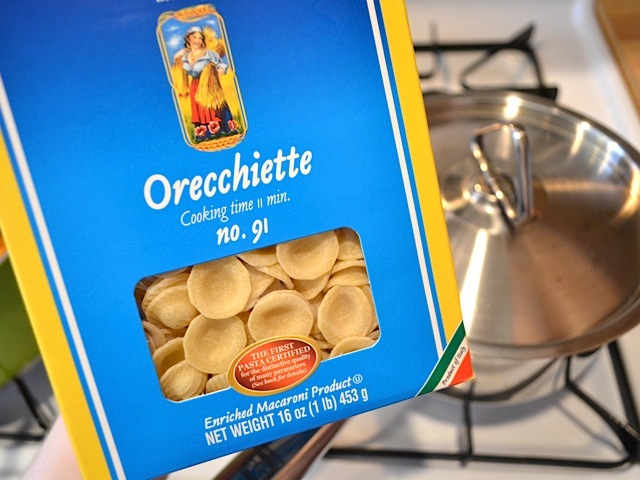 Cook the pasta according to the package directions (boil for 7-10 minutes or until al dente). Drain the pasta. 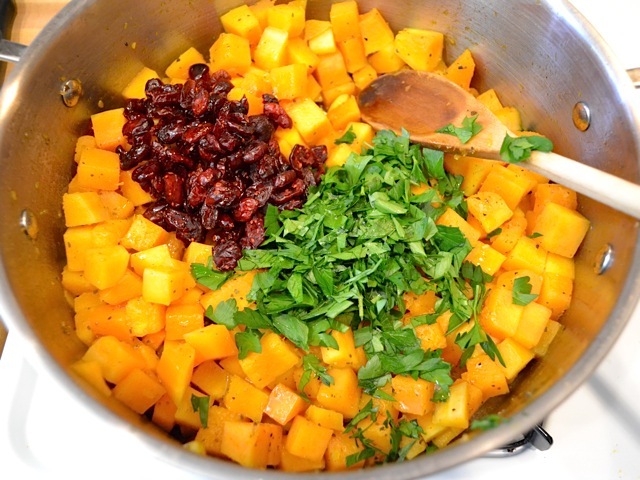 Once the squash is tender and the pasta is drained, add the pasta, cranberries, and chopped parsley to the pot. Stir to combine. Drizzle the last 2 Tbsp of olive oil over everything and add salt and pepper to taste. Lastly, stir in the shredded parmesan. Serve warm! 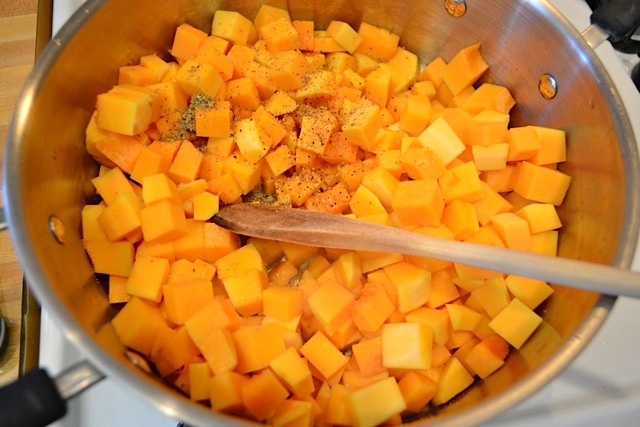 Butternut squash can be large and cumbersome and quite slippery once peeled. 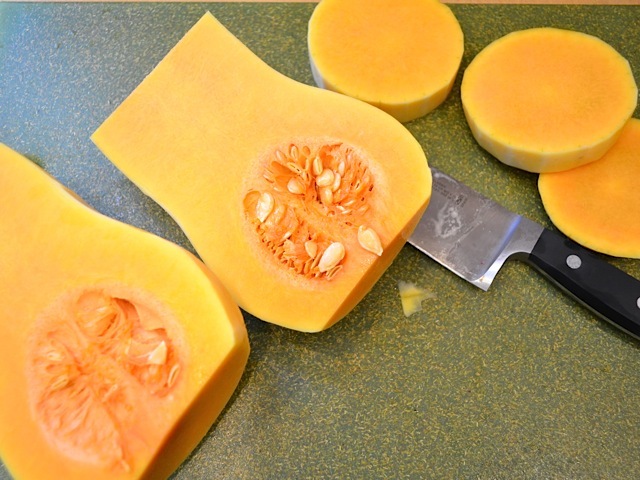 To make a safe, stable surface to cut on, slice the ends off of the squash. Sine the squash is too large for me to hold, I just stood it up on one of the flat ends and peeled straight down with a vegetable peeler. 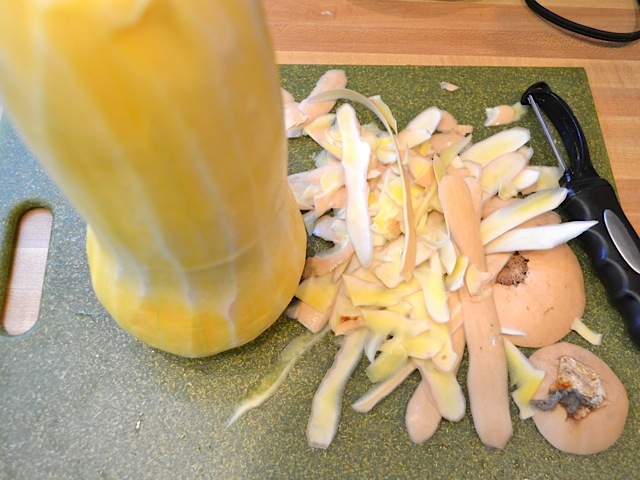 The squash is kind of slimy and slippery without the skin so slice with care. Lay the squash down on the side and slice the skinny end into rounds. Next, stand it back up on one end and slice it open vertically to expose the seeds and pulp. Scoop the seeds and pulp out with a spoon. Heat 2 Tbsp of olive oil in a large pot or skillet over medium heat. Add the squash cubes, dried sage, salt, and pepper. Saute until the squash is tender and slightly translucent. Taste a cube or two to make sure they are cooked through. 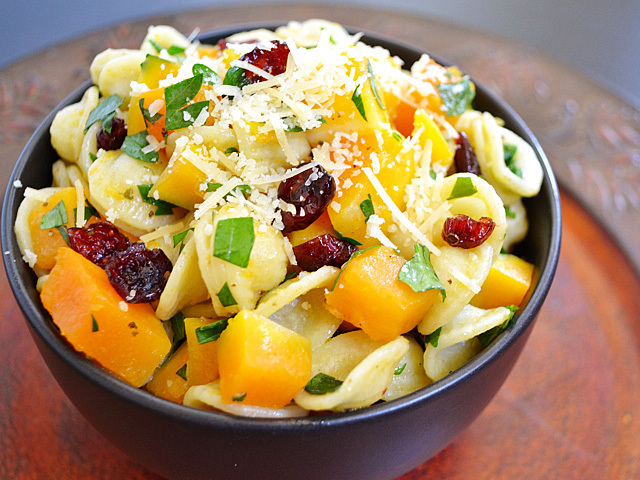 While the squash is cooking, get the pasta going. Salt the water well for added flavor. Once the squash is cooked through, turn the heat off. Roughly chop some parsley and add it to the pot along with the cranberries. When the pasta is finished cooking, drain it, then add it to the pot. Stir to combine everything well. Drizzle on the last 2 Tbsp of olive oil and add salt & pepper to taste. Add the parmesan cheese and stir to combine. I made this and loved it except for the parsley. I found out I do not like that and ended up picking it out. Anything I could substitute for it? I made this tonight to use up a butternut squash that my 3-year-old had wanted to buy. I thought it was delicious, but he wouldn’t touch it. I used thyme instead of sage, since I don’t keep sage around, and the results were satisfactory. I also used about half Romano with the parm. IMPORTANT TIP: Cut the squash VERY small unless your idea of a pleasant evening is to stand at your stove stirring until the sun comes up. Took me like 35 minutes to get mine soft. Looks delicious, as usual! Any suggestions on what kind of beans or other vegetarian protein would mesh well with it? Walnuts! I really can’t imagine beans in this one. Has anyone tried this cold? Granted when I make it, it’ll be warm, but I’m looking recipes that are good cold as well. I don’t like cooking or warming things up in the microwave, and at work all I have is the microwave. So I’m looking for ideas of meals that are good both cold and warm. 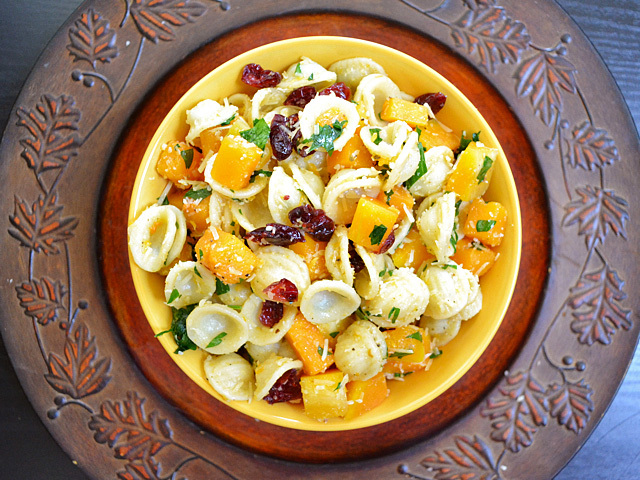 This pasta was so delicious and simple to make! I ended up roasting my squash and it turned out great. I shared this reipe in my latest weekly meal plan on my blog, thank you! Do you know what would be awesome with this? 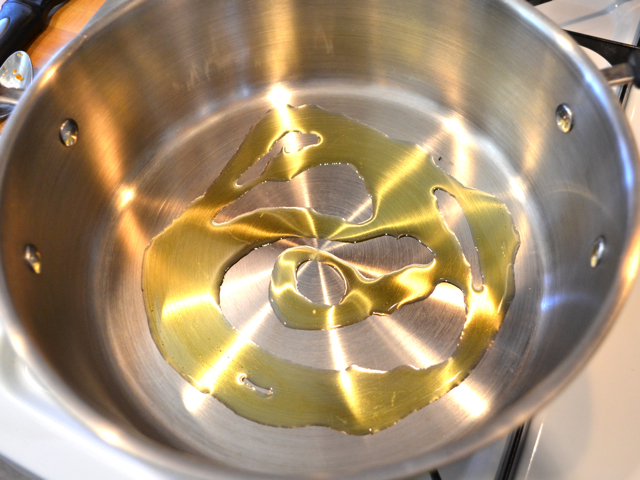 A maple vinaigrette. Or even just a drizzle of maple syrup, but if money’s tight, brown sugar & butter! I made this for ladies night a few days ago (several vegetarians in the group) and it was DELICIOUS! So glad I found it; I’m planning to make it again for mu hubby and will add some grilled chicken to it!